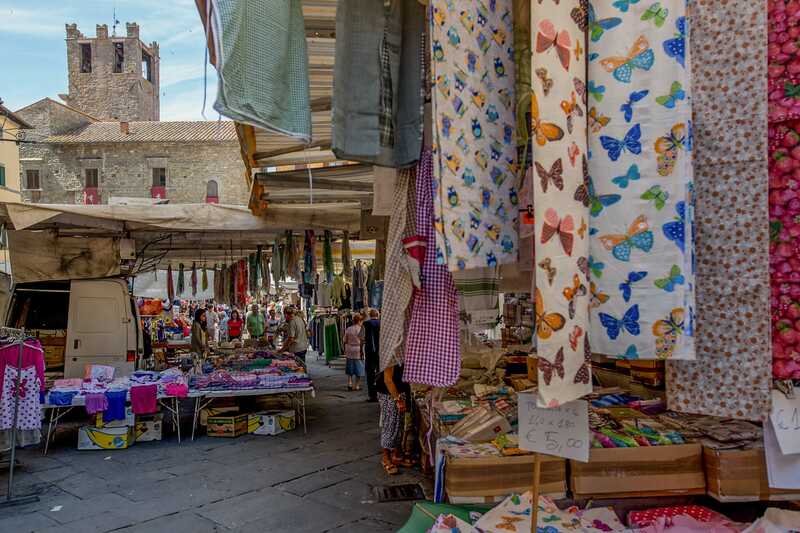 The relationship between customers and shopkeepers in a small town like Cortona is always cordial and confidential, and vendors are available to any tourist even for information about life in the city and how to make the most of it. Shops selling handmade objects such as the characteristic “cocci” of Cortona, earthenware decorated with the symbolic sunflower, are a must. Strolling in the pretty bijou city you will be attracted by charming craft shops where you will find anything from leather to exclusive jewelry, from typical Tuscan furniture to the most sought-after clothing. Antiquarians and galleries alike display their fine pieces along Via Nazionale. Cold meats, wine and other typical products are wonderful tasty souvenirs. Shops are usually open from 9 a.m. until 1 p.m. and from 4 p.m. until 7.30 p.m., however, during the summer months, shops don’t usually close at lunchtime and remain open until 8 p.m. 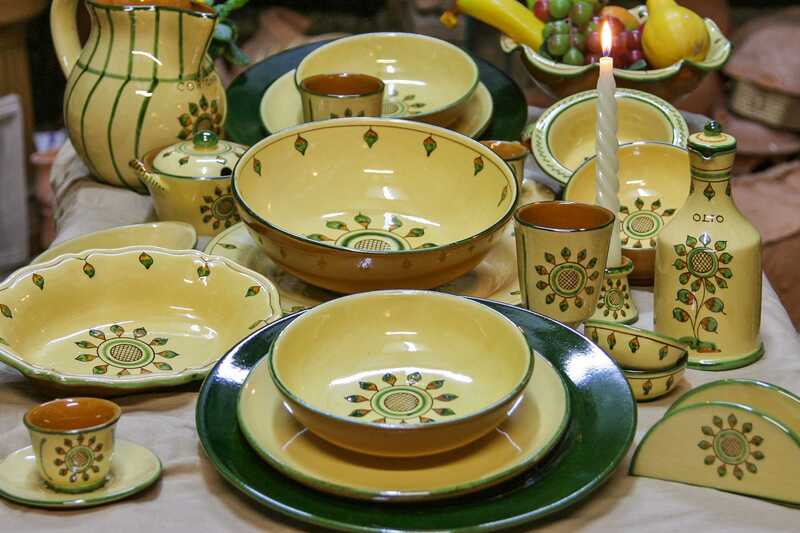 Traditional terracotta from Cortona is known as “cocci” and is made by using an antique engobe or slip technique, which is used when the item to be decorated is still damp and the typical yellow background with the green and brown flower are painted. 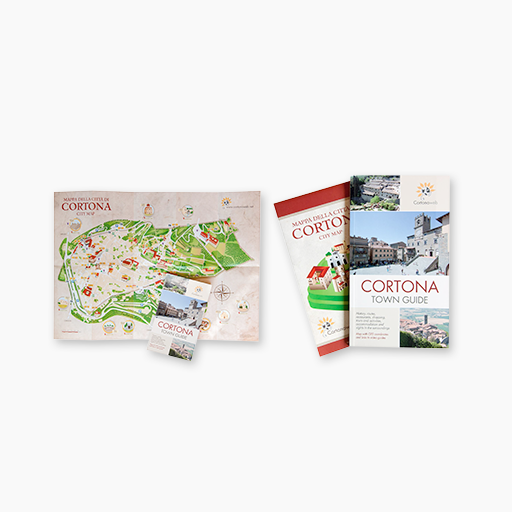 Using this method, Cortonese artisans make plates, cups, carafes and other objects of tableware, but also traditional pots, gifts, vases and much, much more. The items are entirely handmade. When in Cortona, an event you shouldn’t miss is the Saturday market; on Saturday mornings, at daybreak, the Piazza Signorelli and the neighboring streets come alive with multicolored stalls selling a wide selection of fine goods, from high quality produce to typical Tuscan cured meats, cheese, porchetta (if you’re not a vegetarian don’t miss out on this experience and get yourself a juicy porchetta roll, a real must when in Tuscany! ), clothes, shoes as well as flowers, plants, household goods, handicrafts, costume jewelry, furnishings and much, much more. All merchandise is very good quality and reasonably priced. The Cortonese love this market and crowd the piazza and the adjacent streets to shop around the stalls and meet up with friends for a chat. From 8 in the morning to lunchtime, you will be able to browse through this colorful array of stalls, immersed in a unique atmosphere created by the buzz of people chatting around you, stall-owners shouting their best prices to attract customers and scents wafting through the air and making your mouth water.